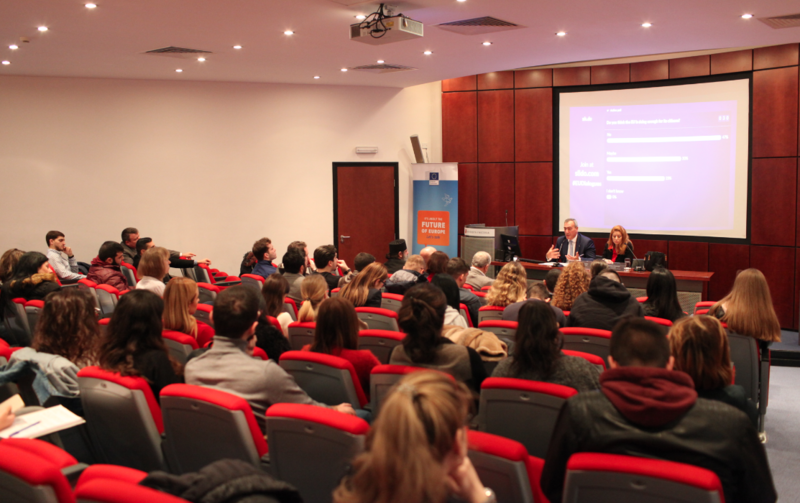 On 14 February 2019 the EC Representation in Cyprus and the European Documentation Centre of the University of Nicosia hosted a Citizens' Dialogue at the University's Amphitheatre with Ierotheos Papadopoulos representing the Directorate General of Communication of the European Commission. The intense discussion with a roomful of students, teachers, representatives of the University and a representative from the Ukrainian embassy touched upon a wide range of issues such as EU funding, the elections, migration, the crisis in Greece and the Prespes Agreement. Participants talked about the divide of Northern and Southern Countries in the EU and expressed concerns about the austerity measures imposed on Greece and the EU's stance in the Prespes Agreement despite the rejection of the agreement by the majority of the Greek people.